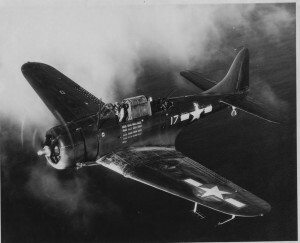 At about 12:30 p.m. on December 5, 1943, APlc O. W. Putner, was piloting an SBD-4 Dauntless, (Bu. No. 10543), 1000 feet over Narragansett Bay when a fire suddenly erupted in the engine necessitating an immediate emergency landing. The aircraft came down in the water about 500 yards south of Beavertail Point on Jamestown Island. Both the pilot and the gunner, AM2c A. A. Bartczak, escaped form the plane before it sank and were rescued. Both men were assigned to CASU-22 at Quonset Point.